On the centenary of the Easter Rising in 2016, it could be Sinn Fein’s Martin McGuinness taking the salute outside the GPO in Dublin, following a dramatic and imaginative proposal by the party this weekend for his nomination in next month’s Presidential election. Although he will always be seen by some as a polarising figure, McGuinness now has an extraordinary opportunity to transform his already considerable reputation as the Provisional IRA commander who became a Minister of the British Crown. Incredibly, he could soon add the title of Uachtaran na hEireann [President of Ireland] to his list of achievements. Although the Presidency is largely a ceremonial post, Mr McGuinness could win the support of hundreds of thousands of disenchanted voters over the continuing tsunami of austerity cuts, taxes and stealth charges by the establishment parties. In the process, he may help Sinn Fein capture a far greater share of the vote then the party could have dreamed of when the Irish Presidency was last contested in 1997. While it remains to be seen how the campaign will progress, the North’s Deputy First Minister has already been billed as a four-to-one outside chance of taking up residence in the Presidential mansion, Aras an Uachtaran, when counting is completed next month. That extraordinary possibility -- that the results of the October 27th election could see the first Sinn Fein head of state since Eamon de Valera -- has energised not just Sinn Fein activists but Ireland’s collective body politic. It has even enthused some of the most traditionally anti-republican media, although a dirty campaign to demonise McGuinness over his Provisional IRA past is seen as inevitable. Since his announcement on Friday, Mr McGuinness has already won the support of four Independent TDs -- Deputies Luke ‘Ming’ Flanagan, Finian McGrath, Michael Healy-Rae and Tom Fleming. Together with the cohort of 17 Sinn Fein members of the Dublin parliament, he now has twenty-one signatures, one more than is required to secure a nomination in the Presidential race. The North’s Deputy First Minister is due to be ratified as Sinn Fein’s candidate at the party’s Ard Chomhairle [high council] later today [Sunday]. Other mooted Sinn Fein candidates, including Cavan/Monaghan TD Caoimhghin O Caolain and former Six-County Minister Michelle Gildernew, are also not contesting Mr McGuinness’s nomination. Speaking on Saturday evening, Dublin North Central TD Finian McGrath said he was happy to give Mr McGuinness the final push over the line. “If Martin McGuinness is good enough for the DUP and the official unionists and good enough for Alan McBride, the victim of the Shankill road bomb, I think it’s good enough for many people in the South. That would be my position,” he said. The Sinn Fein conference in Belfast, which was dominated by Mr McGuinness and hailed as “one of the true great leaders of modern times” by a Protestant clergyman who spoke there, laid the ground work for this weekend’s announcement. Confirming the move from the US on Friday evening, where he was attending a trade mission, Mr McGuinness said he was “honoured” to be chosen as Sinn Fein’s candidate for the presidency. “I hope that my campaign will give citizens the opportunity to make a stand tor the new Ireland,” he said. He said he believed people who had voted for him in the North would be pleased by his decision. “They will be very happy that I, as an Irish republican from the north, will be prepared to stand for the Irish presidency,” he said. As the 26-County economy has oscillated between insolvency and full bankruptcy, the political establishment in the 26 Counties has struggled to find a political leadership that can connect with the people. Into that vacuum now steps the enigmatic Derryman. While his popularity in the 26 Counties remains largely an unknown quantity, the decision by Sinn Fein to field its most controversial figure has the potential to utterly change Ireland’s political dynamic -- or rebound on the party. Either way, it has set a new agenda for Sinn Fein’s activist base to follow. Mr McGuinness will seek to follow in the footsteps of outgoing President, Belfast native Mary McAleese -- but is likely to offer a more meaningful and urgent agenda to the Irish people. In particular, he is expected to underline the point that the Presidency, as the figurehead and representative of the Irish people, crosses all borders -- including the internal partition of Ireland. The failure of the Dublin government to extend voting rights into the Six Counties and to Irish emigrants will also be dramatically exposed by his candidacy. Sinn Fein leader Gerry Adams said he could be “the people’s president” and confirmed that, if elected, he would continue to observe Sinn Fein policy by drawing the average industrial wage. “He will dedicate himself to a genuine national reconciliation and the unity of our people,” Mr Adams said. Speaking on his return to Ireland from the US, Mr McGuinness said he believed he had played a key role in ending the conflict and wanted to look to a new future. Opponents have already said his former IRA role could upset victims of the conflict. Mr McGuinness said the same prospect had faced his party leader, Gerry Adams, when he moved into politics in the 26 Counties, but it had not prevented him winning a seat in the General Election. The Deputy First Minister also said former British prime minister Tony Blair was among the figures who had admitted the key role of British governments in the conflict. He said the plan for his nomination was only finalised in the last week. He said he had considered the proposal while he was in the US, before confirming to Mr Adams that he was prepared to stand. The decision has already been compared by some media commentators with the decision of IRA prisoner Bobby Sands to seek election as an MP while on prison hunger strike in 1981. Mr McGuinness said he believed he had the potential to offer something fresh in the campaign, while the prospect of becoming president could also build on the political process in the North. He said he would stand “on a very broad, progressive platform. “I intend to build on the progress that has been made within the peace process. “And most importantly of all, I hope that this gives an opportunity to Irish citizens to make a stand for a new beginning, for a new Ireland. “I have been at the heart of many new beginnings in the North over the course of recent years. Mr McGuinness is one of a family of seven children (six boys and a girl). His mother Peggy was from Buncrana in Inishowen and he has had a particular relationship with her, as she reared the family alone after his lather William died in 1973. After his education at the local Christian Brothers school, the future deputy first minister got work as an apprentice with Doherty’s Butchers. By 1972 his interest in leadership was already becoming evident. In his testimony to the Saville inquiry he admitted that he was an IRA leader in his home city at the time of Bloody Sunday. In the 90s he became Sinn Fein’s ‘chief negotiator’ before securing the post of Mid Ulster MP in 1997 and then the Stormont Assembly’s first Minister for Education. 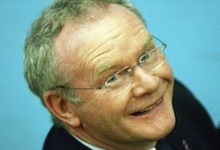 McGuinness has also spoken of his love of fly-fishing and is an occasional poet. He resides in both Derry and Donegal, where he maintains a holiday home.